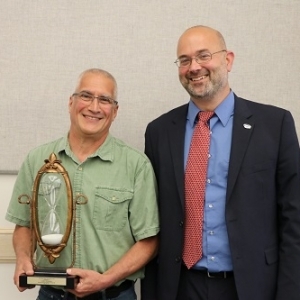 The University of Maine at Presque Isle honored several employees for their years of service during the annual Employee Recognition reception held on May 30. Thirty-four employees were recognized for their combined 395 years of service to the University. Recognized for 25 years of service were Jean Cashman, Associate Professor of Social Work and Field Coordinator, and Lorelei Locke, Director of Advising. Recognized for 20 years of service were Laurie Boucher, Staff Associate in the Student Financial Services Office; Dr. Michael Knopp, Professor of Chemistry; Robert Michaud, Facilities Maintenance Worker; Dr. Raymond Rice, President and Provost; Dr. Allen Salo, Associate Professor of Psychology; Marialuisa “Lisa” Udasco, Administrative Specialist with Conferences and Special Programs; and Dr. John Zaborney, Professor of History. Recognized for 15 years of service were Daniel Lalonde, IT Specialist with the IT Services Office; Dr. Lisa Leduc, Professor of Criminal Justice; and Danette Madore, College Access Coordinator with TRIO College Access Services. Recognized for 10 years of service were Patricia Armstrong, Admissions Communications Manager; Dr. William Breton, Associate Professor of Special Education and Special Education Program Coordinator; Rene Gorneault, TRIO College Access Advisor/Tracking and Success Specialist; Dr. Tomasz Herzog, Professor of Social Foundations of Education and Social Studies Education; Heather Kennedy, Procurement Coordinator with Systemwide Services; Dr. Jason Johnston, Interim Dean of the College of Arts and Sciences and Associate Professor of Wildlife Ecology; Linda McLaughlin, Administrative Specialist with the College of Professional Programs and Education; Rachel Rice, Director of Community and Media Relations; Michelle Richards, TRIO College Access Advisor for Upward Bound/Travel and Family Involvement Coordinator; and Donna White, Facilities Maintenance Worker. Recognized for 5 years of service were Amanda Baker, Recreation Program Coordinator at Gentile Hall; Sarah Brooks, TRIO College Access Advisor for Upward Bound; Dr. Scott Dobrin, Assistant Professor of Biology; Stacey Emery, Assistant Professor of Business; Calvin Hall, TRIO College Access Advisor for Talent Search and Upward Bound; Michelle Labbe, TRIO College Access Advisor for Talent Search; Keli Marston, Fitness and Wellness Coordinator at Gentile Hall; Vanessa Patenaude, ACCE and Assistant Professor of Physical Therapist Assistant Program; Dr. Judith Roe, Assistant Professor of Biology; Tyna Rolon, TRIO College Access Advisor for Talent Search; Levi Saucier, Facilities Maintenance Worker; and Frederick Thomas, Manager of Safety, Security and Regulatory Compliance. During the Recognition Reception, officials also honored retirees Linda Hickman, Administrative Specialist at the Houlton Higher Education Center; Mary Lawrence, Coordinator for Conferences and Special Programs; Eldon Levesque, Director of Business Systems; Philip Parks, Master Electrician; Kim-Anne Perkins, Professor of Social Work; and James Stepp, Dean of Students. 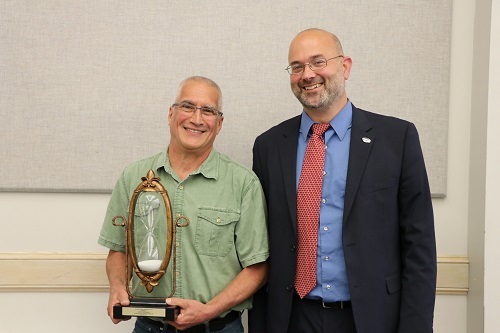 In addition, the Charles Bonin Work Ethic Award was presented to Dr. Larry Feinstein, Assistant Professor of Biology. On October 3, 2013, in honor of Chief Financial Officer Charlie Bonin’s retirement, former President Linda Schott established this award to recognize an employee who demonstrates strong work ethic—including diligence, reliability, and initiative—and has strong principles that benefit the University of Maine at Presque Isle.